missing change-of-circumstance function — has been solved. 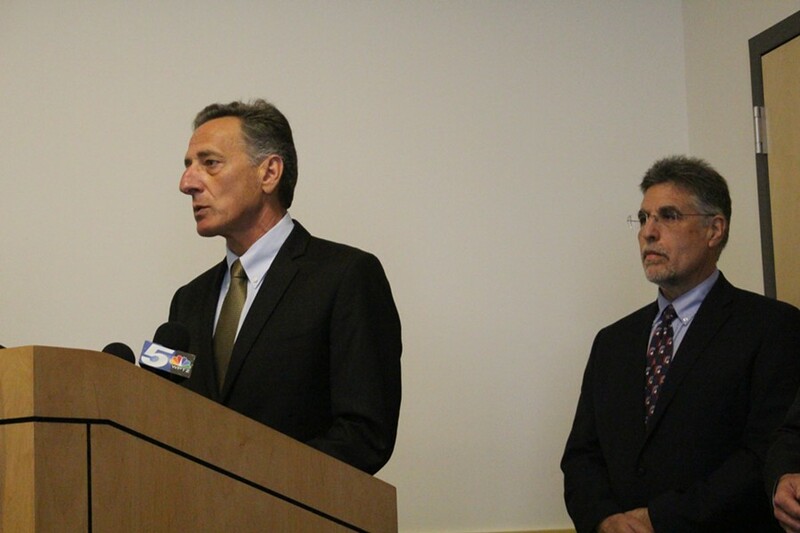 "I am pleased to announce this team behind me has delivered that tool," Shumlin said at a briefing about the upgrade, which adds the ability to make changes to insurance documents that become effective across six systems. The fix was made by the deadline the governor had set in March when he suggested that if this important function couldn't be implemented, it would be time for the state to consider options. One would be to move the state's online health insurance operation to the federal platform. The new automated change-of-circumstance function will be available only to staff. Lawrence Miller, Shumlin's point man on Vermont Health Connect, said it would likely be October 1 before members of the public can type changes into their own documents. For now, customers must continue to call Vermont Health Connect or fill out an online form to process changes. While the governor praised the achievement, he noted, "We have plenty of work yet to do." The next big challenge is to introduce automated renewal, which the state wants its contractor, Optum, to have operating by fall, when the bulk of policyholders need to renew for the next calendar year. Bob Daub, an Optum official at the briefing, said, "Change of circumstance is a key building block to the automated renewal." His company's success delivering it "demonstrates that we are well-positioned to deliver open enrollment," he said. Miller called the successful deployment of this new function "the best indication that the project has been turned around." Vermont Health Connect has limped since it launched in the fall of 2013. Within a month, the governor was forced to call on insurance companies to take over enrolling small employers in health plans because that function had failed. Small employers continue to buy their Vermont Health Connect plans directly from insurance companies and Miller predicted it would be next year before that would be addressed. Fixing mistakes and making changes to individual insurance records quickly ballooned into a crisis. The state jettisoned its first contractor — CGI — largely over its failure to deliver this critical function. The backlog of unresolved cases grew to a peak of more than 17,000 by last fall, shrank to 7,200 during the winter after the state and its new contractor — Optum — put on extra staff, but is now back to 10,000. The state stopped using Optum to resolve backlogged cases on May 15. Vermont Health Connect staff will now use the automated function to address the backlog, but Cassandra Gekas, who is managing operations, predicted it will still take several months to work through the pending cases. She expects to split the team, with some handling backlog cases and others working new requests for changes. Miller said staff will ease into using the new function, ramping up from the easiest types of changes to the more complicated. "The last thing we want to do," he said, " is screw things up in a new way." House Speaker Shap Smith (D-Morrisville) said Miller called him Monday morning with an update about the fix. "My sense from what they are saying is that things are moving in the right direction," he said. "I would like to get some verification from other people involved."